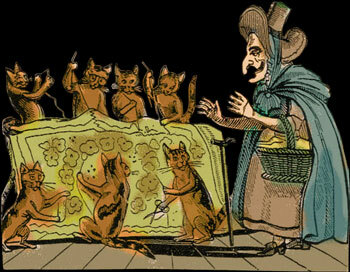 This kitty is out of my private collection, and is one of those that I dearly love because of its very primitive look. 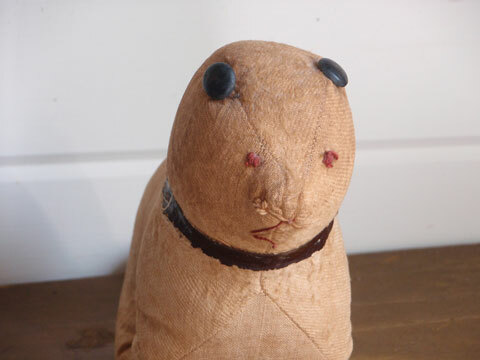 A look created by an enterprising mom who had to either mend or make a new animal out of a much-loved one. As those of us who love these cloth creatures and dolls know, moms would often re-make them for a younger child once an older child had outgrown them. Measuring 9 inches long from tip of nose to tip of tail and standing 6 1/4 inches tall, this feline is hard stuffed with excelsior. Sweet kit’s body is covered in flannel however much of the nap is gone. 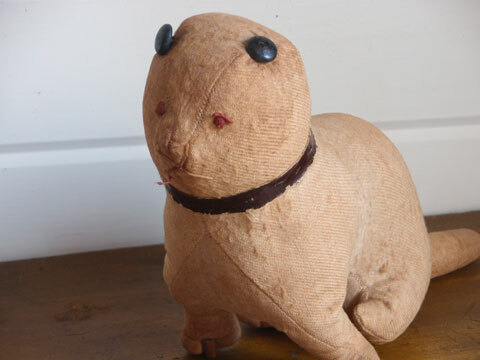 Now the endearing part: said feline’s face has been re-done with cotton floss eyes, nose and mouth and – the best in my opinion- shoe buttons for ears! What was mom thinking? Or was that all she had? We’ll never know except that we can feel it was re-made with much love. As for the paper collar – I’m not certain it’s original or if it came with the re-make. It simply adds to the look of it. Machine sewn with hand finishing, condition is very good, with flannel nap as stated above. 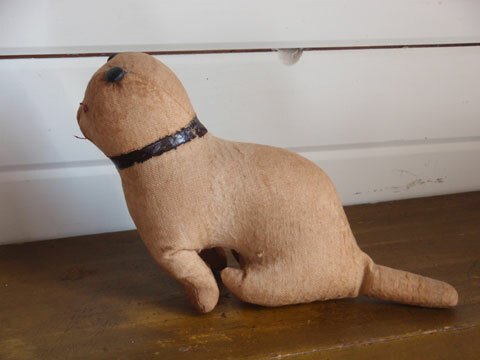 There are two dowels showing through on each forepaw but the wood is dark from age and they serve to keep said kitty sitting upright as he is rather heavy and solid. 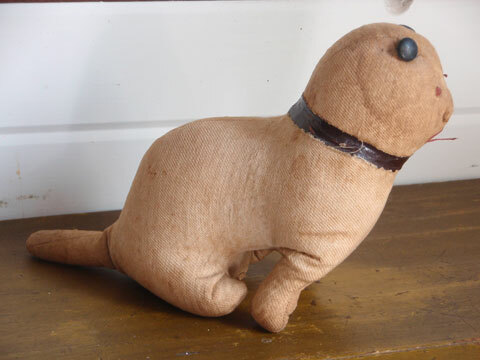 All in all, this late 19th C make-do is certainly a “one of a kind” creature and would make a perfect and unusual addition to a collection of these cloth animals.